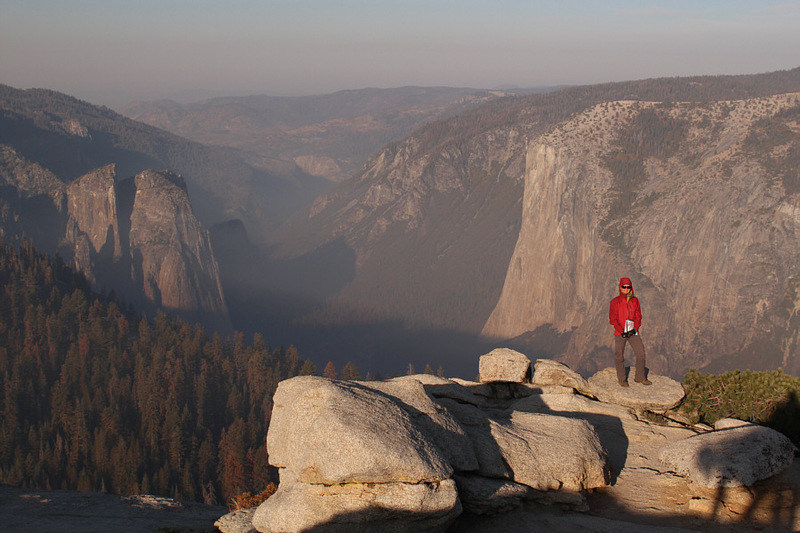 After spending the night camping just outside of El Portal, California, Zosia Zgolak and I got up before dawn on the morning of 11 October 2017 and drove into Yosemite National Park to hike up Sentinel Dome. 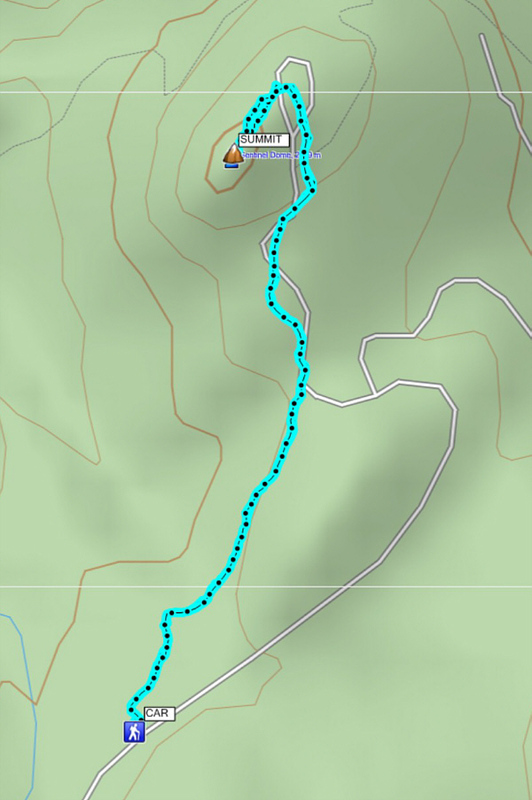 The drive to the trailhead along Glacier Point Road is probably longer than the actual hike itself which is very straightforward with no route-finding difficulties. 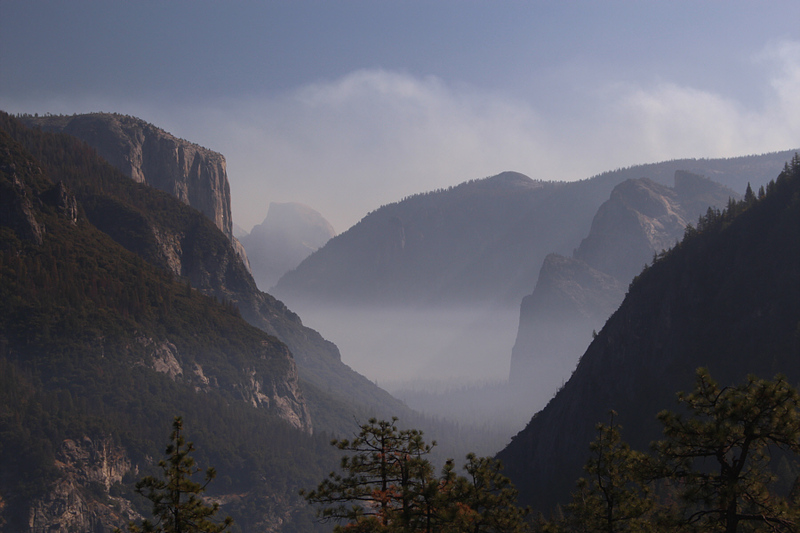 As we had experienced the day before on Clouds Rest, views were marred by smoke from a nearby prescribed burn, but we still took an extended break at the top to marvel at El Capitan and Yosemite Falls. Returning to the trailhead, we subsequently drove down to Yosemite Valley to mingle with hordes of tourists and to use the free Wi-Fi at the local library. Once we had our fill of historic sites and e-mails, we drove out of the park and headed west to check into a hotel in Oakland for the night. 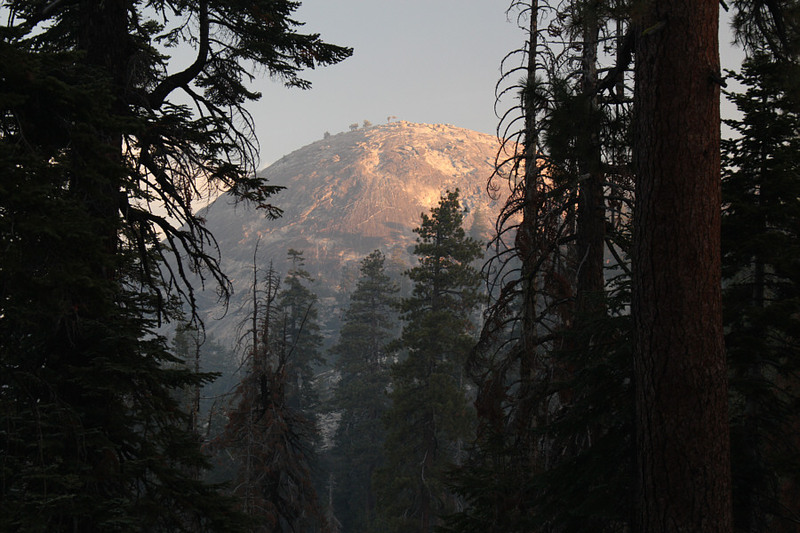 A break in the trees along the trail grants this early view of Sentinel Dome. 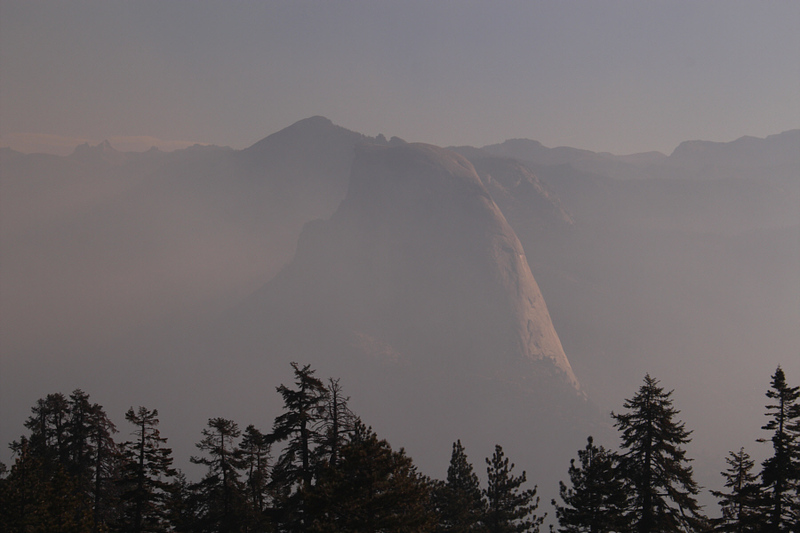 The trees begin to thin out a bit to reveal more of Sentinel Dome. 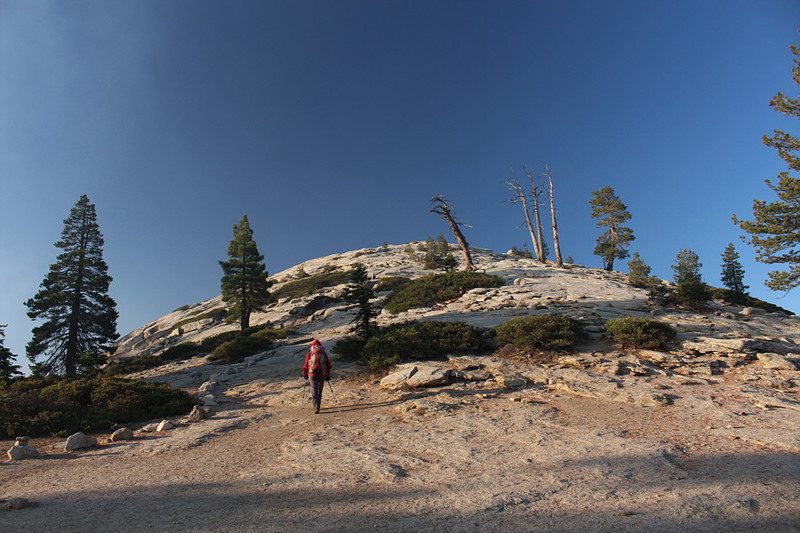 Sentinel Dome still looks impregnable as Zosia approaches a trail junction ahead. 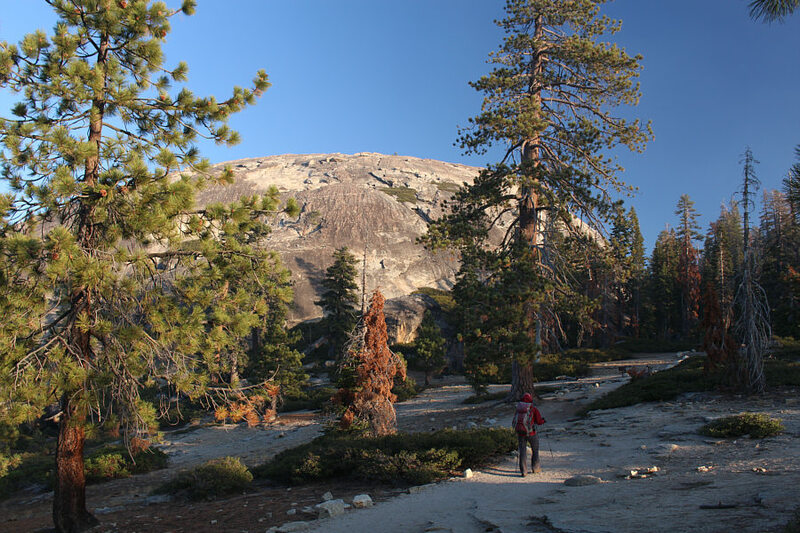 The north side of Sentinel Dome is much more inviting for hikers. 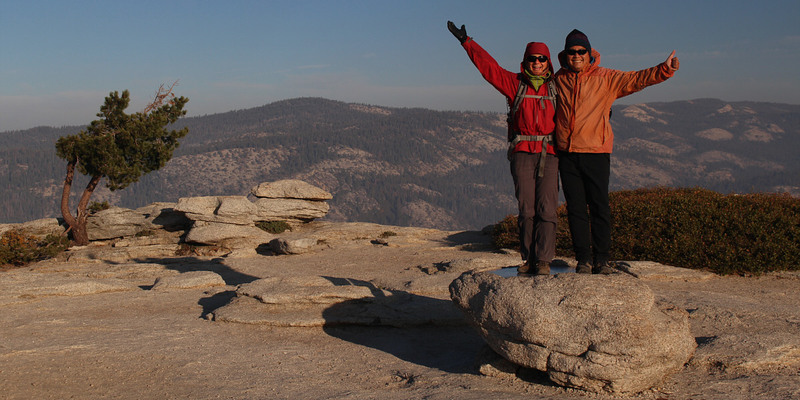 Zosia and Sonny stand near the summit of Sentinel Dome (2476 metres). 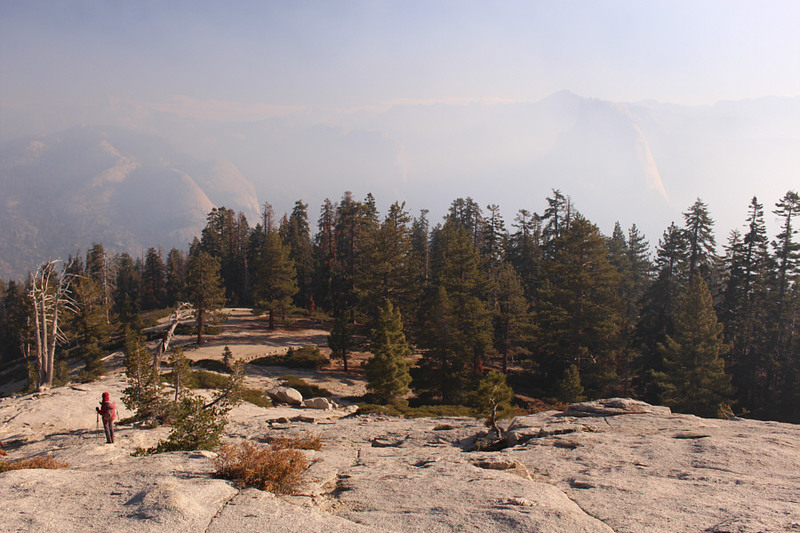 With smoke from a prescribed fire filling the sky, distant landmarks are difficult to discern. 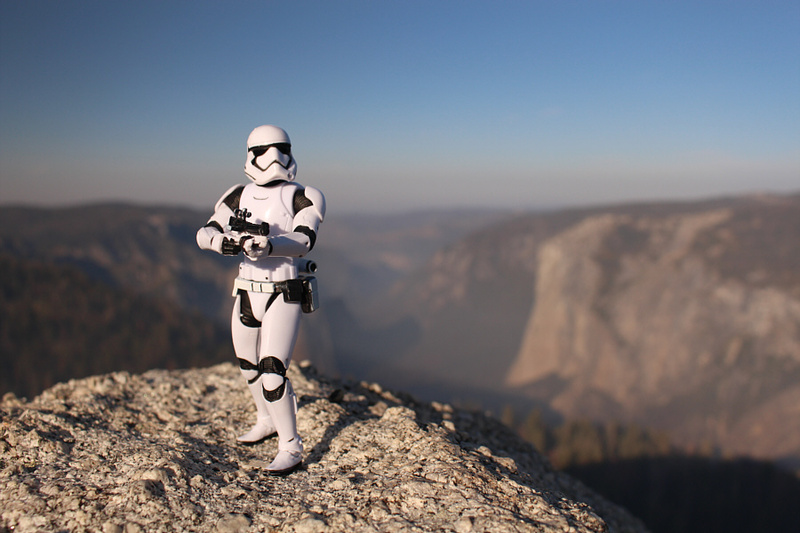 El Capitan is unmistakable despite the haze in the air. 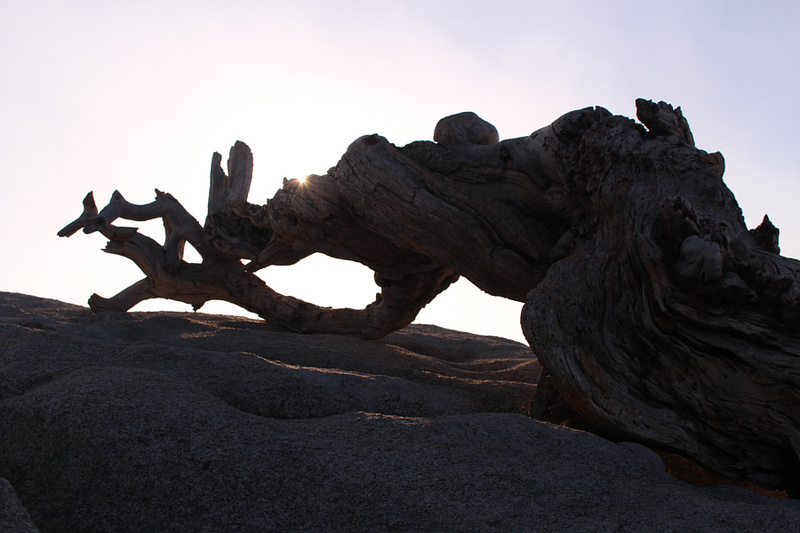 The sun peeks above this long dead tree on the summit. 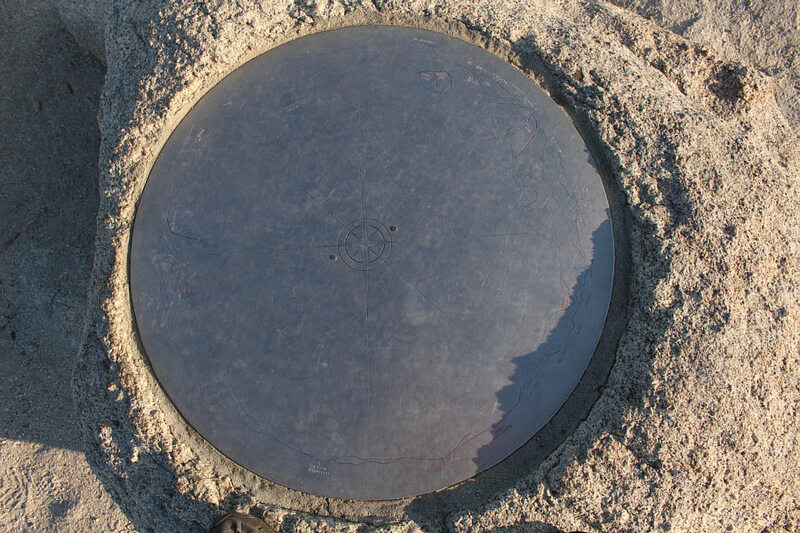 This large disk near the summit helps with identifying landmarks on the surrounding horizon. Zosia stands in front of El Capitan. At left are the Cathedral Rocks. 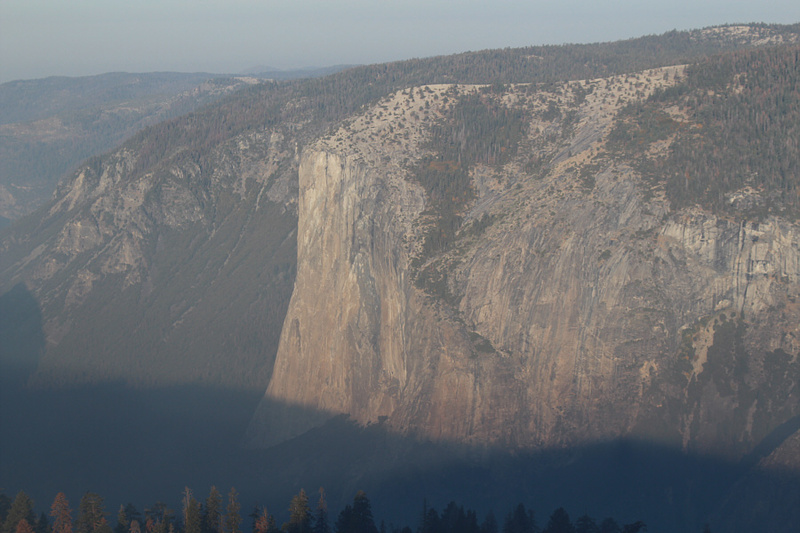 Yosemite Falls can barely be seen across the valley to the north. The falls are supposedly more dramatic in the spring. 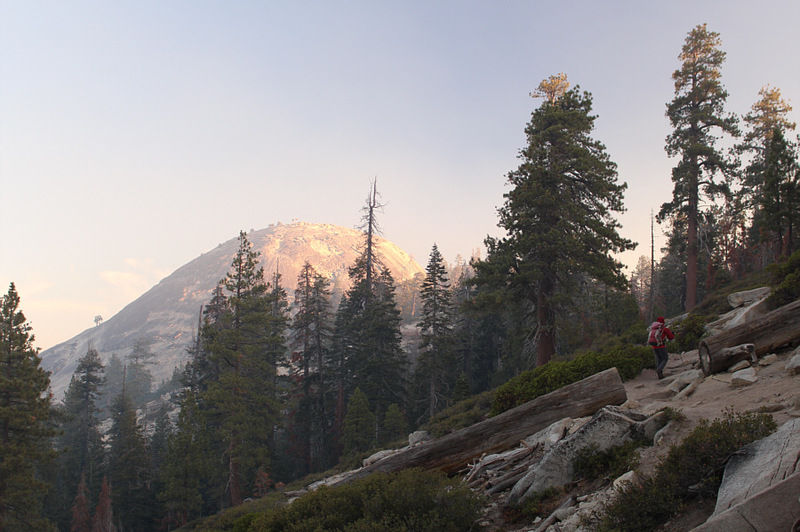 The smoke and haze seemingly let up a bit as Zosia starts to descend. 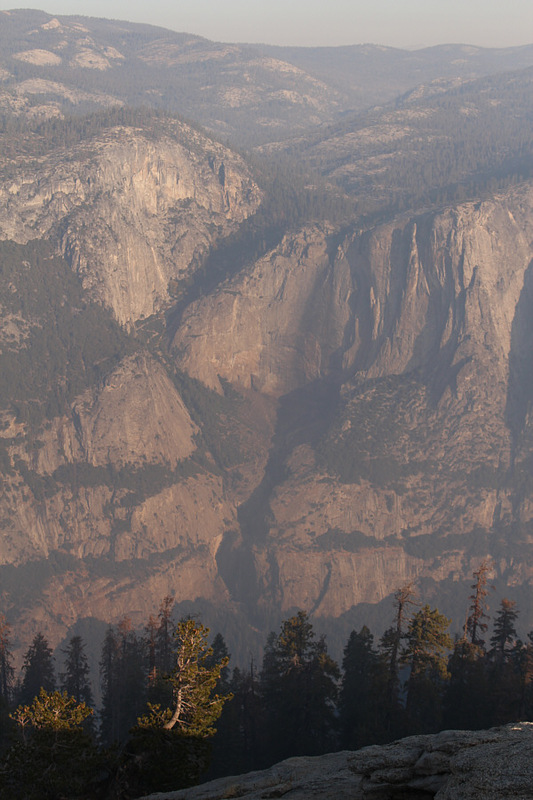 Half Dome's iconic form takes shape to the northeast. 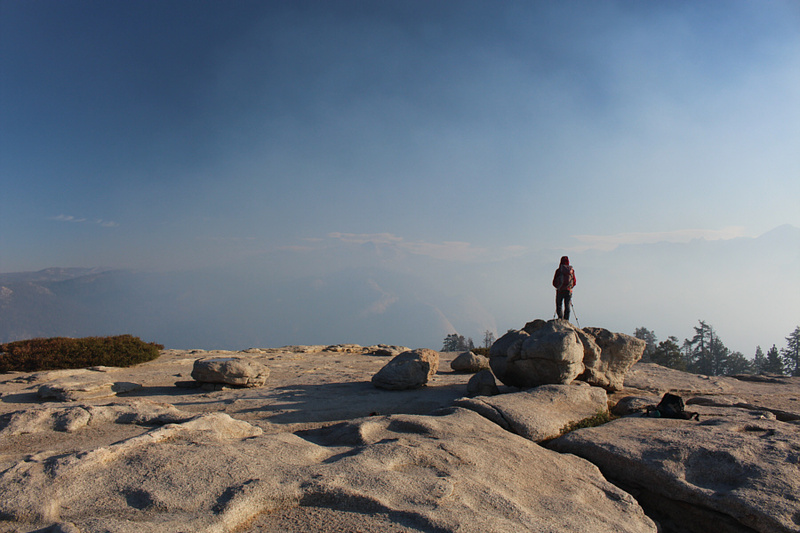 Clouds Rest is also visible further back and a little to the left. A roadside pullout on the way to Yosemite Valley grants this view of (L to R) El Capitan, Half Dome, Sentinel Dome and Cathedral Rocks.